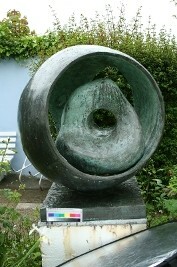 The Hepworth Garden in St Ives contains a number of Hepworth's outdoor bronzes, steel sculptures and stone carvings in a garden setting. The sculptures under go a yearly maintenance program in which all the objects are condition checked, photographed and treated if required. Part of the maintenance of the bronze sculptures is to protect them from the elements while on outdoor display. Outdoor display will have a greater effect on a sculpture than indoor display in museum conditions; the rain, atmospheric pollution, bird droppings, wind, salt from the marine environment and heat from the sun will all have an impact on the sculptures lifespan. The maintenance program at St. Ives is tailored to fit each work and their surroundings. Each sculpture is different and will have different patinations, surface texture and points of weakness. This process can involve waxing the bronzes, as shown below, to provide a barrier to the environment. A number of different waxes and application methods are used depending on the current needs of the object. On this bronze the interior is treated with a cold wax while the exterior is hot waxed. This maintains its intended appearance and provides protection from the outdoor environment. 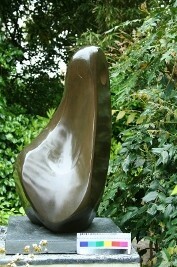 This bronze is hot waxed bronze to a very shiny finish as was intended by the artist.